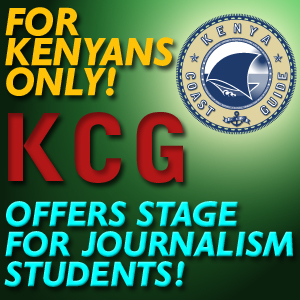 KenyaCoastGuide.com offers journalism students of the last academic year a stage for their work experience. Here you can try out yourself and do your first steps in your currently learnt profession. You should use this stage as an opportunity to try out several topics, to see your articles published constantly and stay “warm” with writing. KenyaCoastGuide.com would like to help you for a successful application for employment at other media. Wanted are students of journalism of the last academic year and also graduates who couldn’t find a job yet. The authors must observe the international common rules of journalism as well they are also supposed to express their own opinion in their articles. This offer is basically addressed to students living in Kenya but also articles of kenyan students and graduates who live in Germany or elsewhere are welcome. The topics should be the ones of an up-to-date news and culture magazine with news from Kenya about politics, economy, society, culture, lifestyle (fashion, music etc. ), new media and more. The topics and categories are up to the authors. Aside from the common journalistic codex and the common rules of fairness and “good taste” there will be no censorship or requirements of topics, articles or style. An article will be published unless another author is dealing the same subject and have sent his article earlier or there are too many authors on the same topic. In that case only the first or the best written articles will be published (publishers choice) unless they are not dealing exactly the same topic. Also the choice of topics is up to the authors as long as not too many authors are dealing the same. In this case the affected authors will get informed by e-mail. 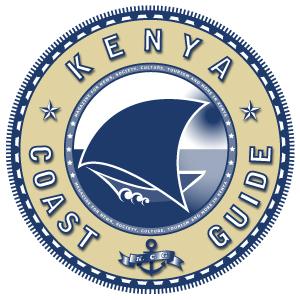 KenyaCoastGuide.com will try to publish the articles as prompt as possible – also a wished date of publication concerning an up-to-date article is possible and can be remarked although there will be no guarantee for the wished date or the publication at all, see rules above. The article has to be sent by email, beginning with name of author, the topic and the category. In fact KenyaCoastGuide.com is an online magazine which is also depend to current photos. The authors are held to support their articles with photos as possible. Photos made with a cell phone are absolutely adequate as long they are in the best resolution the cell phone allows. Unfortunately KenyaCoastGuide.com cannot manage organizational with an unlimited number of authors. A statement about a maximum number of authors is not possible at this time. If a limit is reached it will be published on the website and the concerned authors will be informed by e-mail. In this case authors who cannot join the pool at this time should never give up. Stay in touch and keep on sending an email from time to time because other authors will leave the pool because of finding a job or of other reasons. KenyaCoastGuide.com will not take any responsibility about the correctness of the articles contents. This responsibility is explicit and exclusively on the author’s side. An author’s fee unfortunately cannot be payed by KenyaCoastGuide.com because it is a private financed and organized online-magazine, that sees itself as an support of young journalists application to the market orientated media. Of course KenyaCoastGuide.com will issue a personal certificate for the authors after a number of 12 publications minimum (can be 1 sent article per week, absolute minimum is 1 per month) to complete the author’s application. The certificate will be sent by email as a printable colored pdf-format in an official form and signed by the publisher. Your pic is exclusively for organizational purposes, helps to assign the authors and will be treated like all other of your datas absolutely confidential and will not be published. Only your full name will appear above your articles.